With regular maintenance, an aluminum rig will last for years. But if neglect allows corrosion and fatigue to establish a foothold, it’s only a matter of time before something as small as a corroded clevis pin or a cracked turnbuckle could easily cause your rig to come crashing down. A survey by a professional rigger may be the easiest way to stay out in front of potential rig problems, but if you’re going to check your rig yourself, consider these signs of trouble. The most important thing is to be on the lookout for cracks and corrosion. Even with the rig out of the boat, many potential problems can stay hidden, so take the time to remove and examine both the fittings and the metal underneath. If the rig is painted, watch for bubbles in the paint, a sure sign of corrosion. If it’s anodized, watch for a white, powdery residue. When you’re ready to get started, have the mast pulled, begin at the top, and use the following checklist. Start by closely examining the cap for corrosion, cracks, and wear. 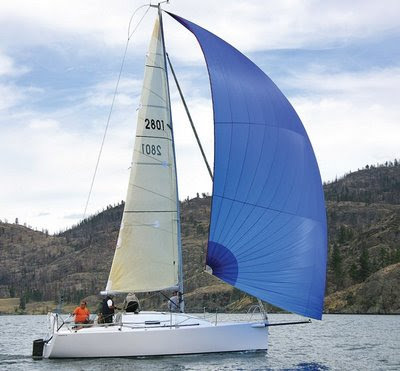 Remove the backstay and forestay fittings and inspect where they attach to the cap. If the holes show excessive wear-such as a groove in the bottom of the hole-or have elongated, the cap needs to be repaired. Clevis pins should be straight and just wide enough to fit through the holes. If the pin is too thin or too long, it may bend or crack. It’s best to replace all undersized pins and all cotter pins. Never replace a clevis pin with a bolt. A bolt’s threads simply act like a file. Check toggles for cracks and corrosion and for proper alignment. Remove all shackles and blocks. Inspect them for cracks, corrosion, and chafe. Also, make sure that the antennas, lights, and wind instruments are functioning and that all wires are sufficiently protected against chafe. A chafed wire not only leads to a faulty masthead light; any stray current, even from something so small, can, when combined with water and salt, speed up rig corrosion dramatically. Don’t forget the halyard sheaves. Make sure they run free and check the axle pin for cracks and wear. Chances are that a shroud will fail where it attaches to something, so shroud tangs and T-ball sockets, which are crucial to the integrity of the whole system and subject to high loads and fatigue, deserve special attention. It’s important to inspect the tangs and T-ball sockets for corrosion and cracking where they connect to the mast. Keep an eye out for corroded or distorted fasteners, and make sure that all stainless-steel fittings are sufficiently isolated from an aluminum mast. It’s also critical to make sure that tangs and T-ball sockets are well reinforced and accept the shroud at the proper angle. A misaligned tang or weak T-ball socket can cause a shroud to fail. As you work your way down the mast, keep an eye out for corrosion, chafed areas, cracks, and dents in the mast extrusion itself. Even a small dent can weaken a mast enough to make it buckle. If your mast consists of two extrusions spliced together, make sure that the splice is tight, straight, and free of loose or corroded fasteners. Spreaders are designed to withstand compression loads, but for them to function properly, the angle that a spreader forms with the shroud must be 90 degrees, i.e., equal both above and below the spreader. A cracked, bent, or overly worn spreader is a good clue that it was probably misaligned and needs to be repaired or replaced. Check for cracks, wear, and corrosion in the spreader bases and check for excessive play in the spreader. It’s a good idea to remove the bases to verify the condition of the interior of the mast wall and of the compression tube running through the mast. Spreader tips are another common trouble spot. They’re subject to extreme load fluctuations and are usually covered with chafe guards that can trap water and starve the stainless steel of oxygen-a perfect recipe for corrosion. Make sure to remove the chafe guards and thoroughly inspect the spreader tips. Because of its proximity to the bilge, a keel-stepped mast is highly susceptible to corrosion. Improper mast drainage and any loose current from a frayed wire can also contribute to corrosion of both the bottom of the mast and the step itself. Excessive corrosion could indicate one or all of these problems. Keel-stepped masts are also susceptible to corrosion where the mast passes through the deck. Check for cracks and wear under the mast boot. 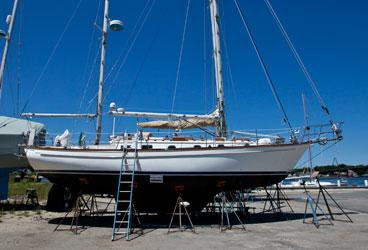 Deck-stepped masts aren’t as prone to corrosion at the base as keel-stepped masts, but it’s still important to check for cracks, corrosion, and proper drainage and to make sure that the deck isn’t deformed. Staylock are generally more durable than swaged fittings, but these still should be checked periodically. Then check the turnbuckles. Make sure each is straight and free of corrosion and cracks. All turnbuckles should be clean and lubricated, and should be secured with brand-new split rings or cotter pins. Next check the wire for corrosion and broken strands. Just one broken strand can make the wire untrustworthy. In many ways, rod rigging is better, although more expensive, than wire, but potential problems with rod rigging are harder to detect. Potentially fatal cracks often occur inside fittings and can cause the rod to fail unexpectedly. Examine each rod head and fitting closely. Chainplates Water and salt often get trapped between the chainplates and the deck, where corrosion is difficult to detect. If the chainplate seal is broken or you see evidence on the inside of the boat that water is seeping down the chainplates, chances are that the chainplates could be corroded and will need some special attention. Do yourself a favor. Fix that cracked turnbuckle or bent fitting now. The rig you save may be your own. 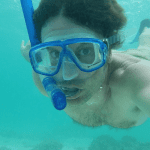 This is an important thing to do before sailing. You must ensure that no cracks and corrosion and make it more intensive look out because some of the problems are hidden.